ABOARD THE VIKING VILJHAM-The morning we arrived in Passau, I was suffering from allergies. Perhaps the beautiful flowering trees had upset my equilibrium. Rarely sick, I was sneezing like crazy, felt rotten and decided to spend the morning in bed. 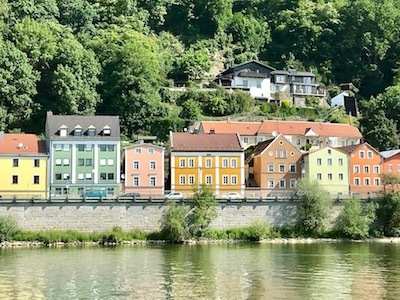 Beyond what I could see of the charming, colorful houses lining the river banks, John, and Wikipedia got the assignment to report on Passau. According to Wikipedia, “Passau, a German city on the Austrian border, lies at the confluence of the Danube, Inn and Ilz rivers. Known as the Three Rivers City, it’s overlooked by the Veste Oberhaus, a 13th-century hilltop fortress housing a city museum and observation tower. 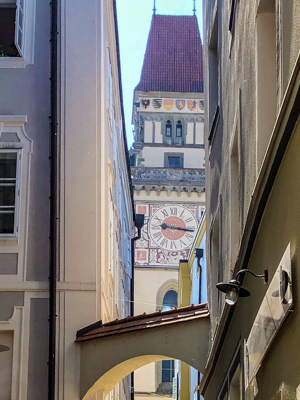 The old town below is known for its baroque architecture, including St. Stephen’s Cathedral, featuring distinctive onion-domed towers and an organ with 17,974 pipes. The complimentary excursion consisted of a walk through narrow streets that have seen more than their share of floods over the years. 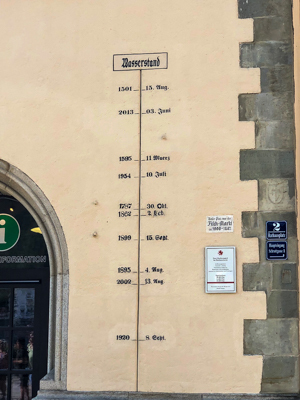 Many of the buildings mark the depths – – some of them high above the heads of tourists straining to make out a cluster of lines and numbers resembling a child’s growth chart on the door jamb. The jumble of rivers has often struck fear into the hearts of the townspeople. This day, their slow drift past colorful old structures (many repainted brightly – – others still showing the waters’ effects) punctuated the town’s charm. Like some old Italian neighborhoods, overhead decorations swung between the centuries old housed on either side. They boasted strange centerpieces – – collections of litter intended to remind those below to show the town a bit more deference. Other interesting “overheads” came in the form of arches high above the ground and connecting two ancient structures. Turns out they aren’t squirrel expressways, but supports to help the old buildings, mostly houses, keep standing after so many years. Some old doors continue to grace the buildings. Many of those with windows bear witness to other sad memories of the inhabitants. They were cut to provide a passageway for the healthy to deliver food to plague sufferers on long poles (hence the 10-foot ones you wouldn’t touch someone with). The cobblestoned streets include brightly and variously painted ones looking like chicklets and serving to direct foot traffic down paths past points of interest. Works of art and artisans dot windows on either side, some of it head-turning. After lunch, everyone on ship seemed to relax, many using the time to pack for the return home. Others were reorganizing for the post tour of Prague. I rallied enough to attend the lecture on the Danube hosted in the lobby. The Danube is Europe’s second longest river, after the Volga, and flows through 10 countries including four national capitals. The waterway has always been an important economic resource and has its own governing body. Its development as an international waterway was boosted by the decline of Communism, when fears of its use as an escape route to the West diminished. Following the presentation, our tireless Cruise Director, Joe, reviewed instructions for disembarkation and transportation to Munich. When Viking arranges your flights, they include pick up and return to the airport, making the process seamless and one less worry. It is hard to underestimate how much care they give to making the process comfortable. Cocktail hour had become another joy of cruising. The choices offered in the premium beverage package make ordering a fun experience. No need to worry about the bill later. John especially enjoyed the single malt whiskies – – all of them first rate, and some of them truly exceptional. Dining is yet another delight on the Viking Viljham. Chef Roman Paput and his small staff that does its creating in cramped quarters shipboard outdid themselves. Every meal arrived at the table looking mouthwatering good and tasted fabulous. The variety of choices were plentiful and varied day to day. I especially enjoyed the offerings of regional dishes, as did others. But beware, ordering dessert becomes a habit, one I must to break at home. For most Boomers, travel is about the experience: going to new places, learning the history and culture, and tasting the local specialties. Viking does all this with bravura and with a style that’s as simple and direct as it is fulfilling.